118 pages, A4 sized card cover, 100 period black and white photos, 5 colour profiles and 16 pages of plans. Interesting and readable text, many B&W photos not published before, colourful profiles and accurate plans. Although the text covers the development of the aircraft from the F onwards, it only covers the operational history of the USAAF flying Fs and Ls in North Africa as do the profiles while the plans only cover the P-40M & N models. A very handy title from Kagero, its just a pity that the profiles and plans didn't cover the same marks as the rest of the book. Kagero books from Poland are not new but have gained a reputation for interesting text, relevant photos, colourful profiles and good plans in several scales. For the last couple of years, they have marketed their books with free decals or masks, usually noted on the front cover but for some reason this one has none. Mind you, don't be put off, the quality is still there as usual. The subject of this particular volume is the Curtiss P-40 with the earlier variants being in vols. I and II. This one begins with the introduction of the Packard V-1650-1 engine into the Curtiss production line for the P-40F. The Packard V-1650-1 was the US name given to the well known Rolls-Royce Merlin 28 built under licence in the US. It didn't have the startling performance improvement that it had in the North American Mustang although it did give the P-40 a useful improvement at high altitude compared to the earlier variants using the Allison engine. Another inovation introducd during the P-40F production was the lengthened fuselage to cure an instability problem especially at take-off and landing. Of all of the 150 odd “Fs” eventually suplied to the RAF, 2 went to the UK for evaluation while the rest went direct to the MTO for the RAF and Commonwealth Squadrons operating there and all were of the P-40-1 (known in the RAF as the Kittyhawk II) short fuselage variant. The next model covered is the P-40L, also with the Packard engine, lengthened fuselage and considerably lightened to gain back some of the performance lost due to weight gain. A more powerful Allison engine was reintroduced for the rest of the variants and although their performance improved, it never eclipsed the high altitude figures of the Fs and Ls. All later variants are covered including the Kand M, known in the RAF as the Kittyhawk III and the N, Kittyhawk IV, with B&W photos of each type and lists of numbers and variants supplied to each foreign air force. The second half of the text come under the heading of “Warhawks Over The Mediterranean” with a sub-heading of “From El Alamein to Tripoli” and covers the USAAF Curtiss P-40 fighters operated in North Africa. More sub-headings of “The Second Front”, “Spring In Tunisia” and “Palm Sunday Massacre” follow and with the invasion of Sicily and Italy, “The Soft Underbelly Of Europe” leads the reader to the end of P-40 operations in the MTO and Southern Europe. 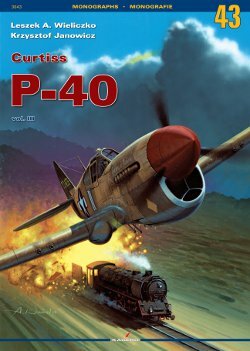 That completes the text section of the book and now we have a series of lists with such titles as Curtiss P-40 – Production Details, Characteristic Features of P-40 Variants, Majer USAAF/AAF conbat units operating the P-40 fighters and Curtiss P-40 – Technical Specifications. 4 pages of colour profiles follow plus one on the back cover starting with P-40F-5 or F-10, S/N unknown, X21 from the 86th FS, 79th FG , North Africa 1943. It's in the standard desert camouflage with the unit badge on both sides of the nose and one of “Pomphrey's Beauties” (“Tiliaella”) on the port side rudder. There is an RAF fin flash on the fin obscuring the S/N. Next is a P-40F-15 “Trixie”, S/N 41-19893 from the 318th FS/325th FG, North Africa, September 1943. The aircraft is in OD/NG with a yellow and black check tail a/c tactical number 40 in white and the “Trixie” nose art on both sides. We then have a P-40L-1 “Dutchess of Durham IV”, S/N 42-10436 coded white 11 from the 314th FS, 324th FG, Italy 1943. This one's in the standard Desert colours with the fin/rudder and tailplane in O/D with nose art on the port side and a yellow diamond on the starboard nose. This aircraft also features in the dramatic art on the front cover. The fouth profile is of P-40F-1 “El Tigre”, S/N 41-14245, coded 87 fron the 66th FS, 57th FG in Sicily 1943. Originally in Sand 49 over Neutral Gray, the Sand has faded to what was known as Desert Pink. There is nose art on both sides of the nose and an RAF finflash on the fin. On the back cover is P-40L-5, S/N 42-10499, coded A10 from the 99th FS, 79th FG in Italy 1943. This a/c belongs to the “Tuskegee Airman” but still wears the markings of its previous owner, the 33rd FG. It has yellow I/D stripes over the standard desert colours and “Africa Special” nose art. The fourth a/c is a short fuselage F while the rest are long fuselage Fs and Ls. Finally we have 16 pages of plans in 1/48th and 1/72nd scales featureing the P-40 Ms and Ns only. Earlier a/c plans would be in earlier volumes. As usual, a very handy title from Kagero, its just a pity that the profiles and plans didn't cover the same marks as the rest of the book. None the less, still very useful.